So here’s the thing: Grasshopper Jungle by Andrew Smith got kind of a bum deal this round. I’m glad I read this book. There are a lot of things I liked about it – the gross-out humor, the crazy science, Robby and Ingrid and the underground compound with all its weird pieces sprinkled throughout Ealing, this dying Iowa town that felt so real in its insular detail. I loved the Unstoppable Corn and the Unstoppable Soldiers and the surreal quality of the science fiction laid over this absolutely normal town in the middle of nowhere. Little things like how Smith uses food metaphors to describe the skin tones of all the white Iowans in the book – subtly pointing out how ridiculous a thing this is to do when describing a person of any color. Big things like how authentic Austin’s confusion regarding sexuality feels. Austin knows he’s in love with both his girlfriend Shann and his best friend Robby, but what does that mean? What should he do? And why does everything on Earth make him horny all the time? Austin’s voice – and the question of how much of this history he’s sharing is actually, reliably true – and the question that rises from that – how much of any history is actually, reliably true? This is the heart of the book. But (and you knew that but was coming from about a mile away – or the beginning of this post, anyway) – I am not the reader for this book. I know there are people out there who love this book. 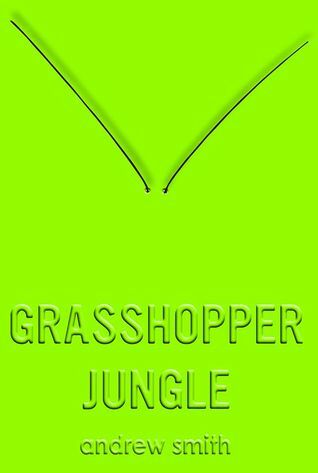 I know there are teens out there to whom I will recommend Grasshopper Jungle and who will adore it. It’s not you Grasshopper Jungle, it’s me. Austin kept going around and around in circles with his history and the voice kept me at arm’s distance, and honestly, I don’t like to have to think so hard about what the author is trying to do while I read (see, bum deal, right?). I knew going in that there were going to be giant, unstoppable bugs who would only want two things – to paraphrase a bit: to eat and to copulate, but it felt like it took forever to get to the, er, copulating bugs!! 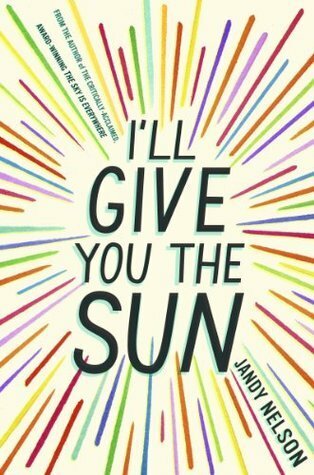 And then I read Jandy Nelson’s I’ll Give You the Sun. And I fell in love. This book – oh man this book. It kept me up ‘til 2 in the morning when I finally had to put it down and go to sleep only to wake up and immediately start reading it again. The twin voices of Noah and Jude separated by time and all the secrets and lies between them captured me in a way Austin’s voice just didn’t. Just like in Grasshopper Jungle there are complex explorations of identity and sexuality going on here both for Jude and for Noah, who are both attracted to boys. The way Nelson structures the two narratives is masterful – revealing clues to what happened in the years between through both sides of the timeline without the plot or the timing ever seeming forced. Because it’s broken up like this, it’s almost a puzzle structure (literary catnip to me – more of GJ’s bum deal) where you can see the pieces falling into place faster and faster towards the end. Grief is a theme of intense interest to me – my brother died in a car accident over 8 years ago and a close friend followed several years after from the flu – and this book is chock full of grief. Grief not only for those who have left us through death, but grief for how we hide ourselves from the world and grief for how often we seem to harm the ones we love. But Nelson also shows how humor is still there – even when our worlds are falling apart. I kept stopping to read funny parts out loud to my husband. “I’m so glad I’m not a horse.” “Did you just say you’re glad you’re not a horse?” The way Nelson captures these things makes me wonder what kind of loss and grief she has lived through that she can depict them so well. I can only hope that any teens I know who are dealing with grief in their lives find their way to books like this one. With all these themes (I didn’t even talk about forgiveness or ghosts or magic), I never felt bogged down in my reading. There were so many avenues of thought to explore, but I didn’t feel like I was admiring Nelson’s technique from afar – I was right there in the middle of it.. And on a slightly shallower note, the make-out scenes in I’ll Give You the Sun were really, really hot. Plus, I’m a sucker for a happy ending. So, Grasshopper Jungle I like you a lot, I hope we can be friends. But my heart belongs to I’ll Give You the Sun. I just hope the next judge treats you kindly. This entry was posted in Book Review, Tournament of Books and tagged Action, Drama, Family Relationships, Romance, Science Fiction by librandian. Bookmark the permalink.